The powerful imagery of the Himalayan mask tradition is drawn from the diverse traditions of shamanism, village myths and the classical traditions of Buddhism and Hinduism. In this essay the author probes the 'greater context' of Himalayan masks, finding in them stylistic and thematic affinities with cultures as widespread as those of Eurasia and the Americas, and covering a period extending from the upper Paleolithic era to the present. Surviving in isolated valleys, and hemmed in by the world's tallest mountains, the peoples of the Himalayas maintain a subsistence economy of pastoralism and horticulture. They identify with the syncretic belief systems known to us as animism, Hinduism and Buddhism, and share a common love of the masquerade. The broad dispersal throughout the Himalayan region and beyond of a masking tradition suggests that it has ancient roots. For the purposes of this article, Himalayan masks will be divided into three main categories. Masks which depict deities, heroes, and comic characters from the 'high culture' of Buddhism and Hinduism have been described as 'classical', and include monastery and temple masks which are worn by Buddhists and Hindus in dance ceremonies. Many Newari masks (4) from the Kathmandu Valley in Nepal portray Hindu gods and goddesses or subjects from epic dramas such as the Ramayana and the Mahabharata. Classical Buddhist masks often depict figures from the great Buddhist pantheon, including ferocious defenders of the faith such as Mahakala (3). Some of the Buddhist masks introduced here were used in the mysterious dance known in Tibet as Cham, in which protector deities are invoked and negative forces are dispersed. 'Village' masks often incorporate elements from the classical Hindu and Buddhist traditions, but their primary defining characteristics derive from local village myths. Lakhe masks, popular among the Hindus of the Kathmandu Valley, may be considered to belong to this category. 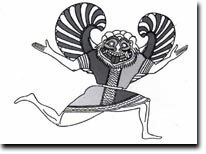 Lakhe is a local demon most commonly depicted with characteristically Gorgon-like features (7) reminiscent of the Gorgon face familiar in Mediterranean sculpture and painting traditions (6). Lakhe's appearance, however, is undeniably linked with Indra Jatra, the annual festival associated with the classical Hindu god, Indra. Readers will note that Indra (4) and Lakhe bear similar markings on their foreheads. Village Buddhist masks, largely created by the rural ethnic Monpa and Sherdukpen peoples of Arunachal Pradesh in northeast India and eastern Bhutan, were often used in morality dramas, such as the Ache Lhamo, which will be described in greater detail below. Primarily from the tribal areas of Nepal, another style of mask, the 'Primitive-shamanic', may have been used by sorcerers for purposes of healing, oracle augury and life crisis initiations (8). 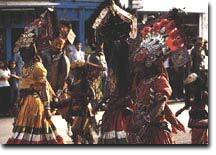 Our ignorance is great with respect to these tribal masks. One reason for this lack of knowledge is the very remoteness of their geographic origin. While this has favoured their survival, it has also inhibited our knowledge of the people who created them and the cultural traditions requiring their use. I would suggest that these masks are the expression of an ancient pan-Asian mask culture which was still in evidence at the beginning of the 20th century not only in the Himalayas, but also among Indonesian islanders such as the Batak of Sumatra (9) and the Atoni of Timor, as well as among the tribal people of India, the shamans of Siberia (14) and others. The making and use of masks, born of shamanism, extended into Himalayan village folk traditions and eventually became absorbed into the higher classical traditions, invigorating them and giving them new meaning. In Asia, masks were probably first used in a shamanic context, and for this reason, my discussion of Himalayan masks begins with the primitive-shamanic. At best, specific ethnic attributions of primitive-shamanic masks are speculative. The reasons for this uncertainty include similarity of function and iconography and the aforementioned isolation of these peoples from Western observers. However, it is clear that most Himalayan shamanic style masks were created in Nepal. The Magar and Gurung tribes, living at an altitude of 7,000 feet in the middle hills of the Himalayas, have produced hardwood masks which tend toward a glossy, high patina arising from exposure to smoke and butter fat. Less well known ethnic groups of the middle hills include the Sherpa, Bhotya, Tamang and Rai, some of whose masks will be mentioned below. Masks of the lowland Tharu people, living near the Indian border, are often of a softer wood, pigmented with polychrome or white kaolin clay. Hardwood examples also exist. Some masks from the Tharu tribe are among the most primitive examples to have come to light, while those of the Rajbansi (village dwellers in the Tharu) display iconography more directly derived from Hindu models. The latter are examples of what I have termed village masks, to be discussed in greater detail below. An interesting illustration of the distinctions between primitive and village Tharu masks can be seen in plate 22. On first examination, these masks appear to defy categorisation. Each mask seems to be unique. But after viewing many, we begin to see that they fall into iconographic groups. Masks with fur attachments, creating a bearded, mustachioed character (or characters), whose identity remains undocumented (9, 10) are often encountered. Other masks, probably from the Middle Hills, do not now possess bearded attachments, but perhaps once did, and may therefore also belong to this group. Another character, with a lumpy head and brutish facial features, also appears often; we have dubbed this type 'Potato Head' (12). Markings on the forehead sometimes offer a means of classifying masks. One example (13) bears a prominent trident mark - an attribute of the Hindu god Shiva - and many masks with this mark have survived. However, in this context the trident does not necessarily imply a knowledge of Shaivite religious dogma, but may simply be an instance of a symbol borrowed in isolation from its original meaning. Other masks display a solar disc above a crescent moon, but again the meaning of such a motif remains as yet unclear. The mask illustrated in plate 16 has a ring in his nose which is a common feature of the Tamang tribe, though we cannot be certain that this particular type arises from the Tamang ethnic group. The Rai are known to fashion house-protecting masks from tree fungus (17), while another multi-ethnic character mask is created from felt and goat skin. The red pigment around the mouth of plate 18 may well symbolise blood sacrifice, either animal or perhaps (in former times) human. We may infer great age for these masks. Their black, shiny patina and their surfaces of multi-layered pigment all suggest an unspecified but undeniable antiquity. 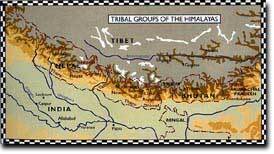 That they have survived for so long suggests they were greatly valued by the Himalayan societies that created and used them. Passed on as heirlooms from generation to generation, each use added sacred power. It is also clear that old masks were repaired rather than discarded (16). There can be little doubt that many of these masks are hundreds of years old. Precisely how they were used we cannot say, but we may infer much by examining, albeit briefly, the principles of shamanism. Shamanism is the term commonly used to describe the indigenous belief systems of the ancient cave painters of Europe, the autochthonous Asian minorities, and the North and South American Indians. More of an animist world view than a religion, it is thought to have been brought to the New World from Siberia by reindeer hunters following their prey at the time of the last Ice Age, circa 15,000 BC. The etymology of the word shaman is interesting. Long believed to be derived from the Siberian Tungus word saman (itself thought to be native Altaic), it has recently been suggested that its etymology goes deeper still. It seems that the Siberians borrowed the term from the Chinese shamen, meaning 'wandering Buddhist monk', to give title to their own ancient religious practices. This linguistic relationship reflects the respect felt by the Siberians for the awe-inspiring Buddhist practices which they observed. As discussed in greater detail below, Buddhism also assimilated elements of shamanic practices. Certain themes present themselves wherever shamanism is found. For example, the shaman is not the greatest warrior of the tribe, an office more likely to be held by its chief. Rather, the shaman often begins his or her life as a sickly individual - either physically or mentally impaired. There comes a time when he or she must depart the community and live alone, and it is during this isolation that the shaman calls upon nature spirits, such as animal totems, to be vehicles of self-healing. If unsuccessful, he or she is not heard from again. However, assuming a positive outcome, the individual returns to the community empowered by these spirits in strange and mysterious ways. As a result of this 'conversion experience', such an individual may live within the village, but is always perceived as socially distinct from others in the community. And what role does a shaman play in his or her community? Ancestor spirits hover nearby, monitoring adherence to local traditions and taboos. They require careful propitiation. Moreover, all of man's ills ultimately derive from the spirit world. Malevolent spirits must be subdued. All of nature is alive with the supernatural. The shaman, through his or her magical interventions, operates on this other plane. Existentially, the individual who is 'the other' within the earthly community more truly inhabits the world of the spirits. Fertility and 'life crisis' transitions are the basis of many animist concerns and rituals. These include birth, puberty, marriage, attaining a social rank (status) and death. At these moments of transition, an individual is in grave danger as he 'dies' in terms of his former self and has not yet been reborn into his new identity. At these moments of vulnerability, it is the shaman who ushers the initiate's soul across the uncertain gulf. Therefore, the shaman serves as a bridge between this world and the next, acting as a 'soul guide' to ease these life passages. In order to operate on this higher plane, the shaman must fully identify with the powers which he hopes to wield. Masks are one of the empowering mediums by which the shaman 'becomes' the spirit which he invites to possess him. Such possession is described as an ecstatic experience. Other tools which help bring about this transformation include ritual costume (20), weapons, drums, and perhaps psychotropic substances, including fly-agaric mushroom (amanita muscaria) and hemp (cannabis). The shaman functioned not only as priest of this other world, but as a practising physician whose knowledge of drugs extended to practical cures for physical ills. These organic medicaments might be administered during rituals involving mask use for demonic exorcisms. Folk medicine entailed a great understanding of ethno-botanical pharmacology. This knowledge was preserved from generation to generation, and thus the office of shaman encompassed that of ecological conservator. Central Asian shamanism was diffused on horseback. 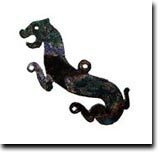 Early archaeological evidence suggests that shamanism permeated a bronze-using culture stretching from Tibet through Ordos, west China, and southern Siberia. Across this territory, two primary cultures existed, often in opposition- settled farmers and aggressive, nomadic herdsmen. Both held animistic beliefs, each using shamans to intercede in the spirit world for their own particular ends. Icons of the aggressive herdsmen include animal deities expressed in an art that has come to be known as the 'animal style'. Subjects depicted include the steppe tiger (15) leaping on the back of a deer, reflecting the theme of victor and victim. A lineage of shamanic barbarians must include the Scythians (6th to 4th century BC), the Huns (300-100 BC) and later, the Mongols (Genghis Khan, circa 1162-1227, and his descendants). The settled peoples, frequently targeted by the aggressive horsemen, sought refuge in remote valleys where their descendants may still be found today. Himalayan scholars generally believe that the origins of the Tibetan people lie in the nomadic, non-Chinese Ch'iang tribes who lived off animal husbandry many centuries before the Christian era in eastern Central Asia and in the far northwest border region of China. It is highly likely that they participated in the Central Asian culture of shamanism and the migrations broadly described above. The physical evidence of this prehistoric (pre-7th century AD) shamanic culture can still be found in Tibet today. The Tibetan cultural historian, R.A. Stein draws attention to "the sets of minhirs and tombs arranged in stone circles in the lake region on the southern fringes of the Changthang [the northern portion of the Tibetan plateau]; and the 'animal style' in the decoration of metal objects (knives, stirrups, buckles, etc.) practised at Derge and in Amdo [in eastern Tibet], which is similar to that of the Ordos bronzes and the 'Scythian' art of the steppes"(15). Some of the cultural minorities of Nepal preserve an archaic Tibetan tongue. They are thought to have migrated from the central Tibetan plateau long ago. Certain scholars suggest that insight may be gained into the culture of pre-Buddhist Tibet by examining today's Magar and Gurung tribes of Nepal. It is my contention that the primitive-shamanic style masks of Nepal (14, 21), so similar to those of Siberia, are a continuation of a common type possibly used in Neolithic Tibet. Shamanic traditions existed in India as well. These traditions are preserved among the tribal minorities of Central India, for example in Rajasthan. The stylistic conventions of their masks are most akin to those found on the Tarai, not unreasonably, given their relatively close geographic proximity. The tribal minorities of India were pushed aside by the advances of the Aryans during the second millennium BC. Little is known about these Aryan tribes except that they entered India through Afghanistan and the Hindu Kush, speaking a proto-Indo-European language. They preserved an oral tradition of the Vedas (which were to become the fundamental Hindu scriptures), extolling philosophical principles of karma (the laws of cause and effect), caste, and the authority of the priestly class. By its very nature, Hinduism is syncretic, absorbing many indigenous belief systems, including the worship of nature spirits. One finds many elements of animism, and by extension the principles of shamanism, deeply imbedded in this 'high culture' religion. The other great Indian religious tradition to influence Himalayan masks is Buddhism. Biographical details of the Buddha ('The Awakened One'), historical founder of the faith, are fairly well established. Born a prince of the Shakya clan in Kapilavastu, near the present border of Nepal and India, he was appropriately named Siddhartha (He whose aim is achieved) Gautama, and lived from approximately 560-480 BC. Isolated within the walls of his father's opulent palace, he was spared the knowledge of human suffering. In a series of excursions outside the palace during his twenties, he encountered the existential suffering which all must face: poverty, sickness, old age, and death. These encounters so moved him that he renounced his birthright and became an ascetic, joining yogis in the forest. After seven years of meditation and ascetic deprivation, he achieved Enlightenment under the Bodhi tree in Bodh Gaya. After some initial hesitation, he decided to share his hard-earned insights and spent his remaining forty-five years teaching. The Buddha's teachings are rooted in a compelling observation: despite all the efforts of human beings to find happiness and avoid pain, their lives continue to be filled with suffering and dissatisfaction. However, the Buddha did not stop there. He recognised that the causes of suffering lie within our very own minds: they are delusion, attachment, aversion, pride, and envy. The Buddha also realised that it is possible to free oneself permanently from suffering through a rigorous and well-structured training in ethics, meditation, and discriminating insight, which leads to a profound understanding of the way things really are, that is, enlightenment - a state of profound freedom and complete fulfilment. The original Buddhist teachings were atheistic. However, it may be observed that it is human nature to yearn for a personalised saviour. As the tradition was passed from generation to generation, many buddhas and bodhisativas (compassionate beings who assist sentient beings in their efforts for spiritual salvation) came to form a vast Buddhist pantheon. From its humble beginnings under the Bodhi tree at Bodh Gaya, the teachings of the Buddha spread overland and by sea to nearly all parts of Asia. Buddhism's path to salvation depended largely on the individual's own efforts, and Buddhism's doctrine of self-reliance and non-violence appealed to the merchant class in India and thus it spread along trade routes - north through Central Asia, into China and then into the Far East, Korea and Japan. It also spread south to Sri Lanka and Southeast Asia - Burma, Thailand, Indo-China, and Indonesia. Nepal and Tibet embraced Buddhism at the zenith of its development in India, and it was this tradition which eventually came to permeate Mongolia, Manchuria, Kalmykia and Tuva (the latter two in present day Russia). It is interesting to note that in this final group of countries a form of Tibetan Buddhism returned to the region frequently associated with the origin of Central Asian shamanism. Buddhism entered Tibet in the 7th century AD. The transformation of Tibet from an essentially animistic culture to a radiantly Buddhist one is a fascinating story. One of the major players in this tale is Padmasambhava. A great Indian Tantric Buddhist adept from the Swat Valley (modern day Pakistan), he was instrumental in founding the first Tibetan Buddhist monastery at Samye (777-779 AD), south central Tibet. It is said that he overpowered the ancient mountain gods of the old religion (Bon) and converted the wrathful deities, convincing them to become defenders of the new faith. Padmasambhava is also said to have introduced the Vajra Dance (rdo-rje gar) at Samye Temple. This practice continues today under the name Cham in celebration of Padmasambhava's conquest of the Bon religion. Taking place in a monastery, masked monks in deep meditation perform dramas first imported from India and prescribed by Sanskrit-based Tantric texts. The ritual lasts for three days. In masks, Padmasambhava appears in his natural and animal manifestations (19). Wrathful protectors of the faith or dharmapalas (23), including Mahakala, exhibit their fierce visages as spectators enter into the transformation process of the masquerade. In this way, Buddhist doctrine is transmitted to literate and non-literate alike through meditation in action. This dance tradition takes a form known as Mani Rimdu in Nepal. Tantric Buddhism often invokes imagery associated with death. Such imagery points both to the demise of ego which is associated with spiritual transformation, and to the all-too-brief duration of our physical existence. Chitipati, the skeletal Lord of the Funeral Pyre, is a particularly powerful example of this iconographic theme, and is easily identified as a grinning skull mask (25). Remarkably, but also typical of the wise Buddhists of Tibet, Chitipati is also seen in a humorous light, his joker-like antics offering relief from the profundity of the other lessons observed during the Cham drama. Remarkable masks are also associated with the Tibetan Folk Opera known as Ache Lhamo. A morality play involving participation from laymen and women, this popular drama uses dance and song to illustrate the power of Buddhism to overcome all negative forces. Another folk dance tradition, practised by the Monpo and Sherdukpen people of Bhutan, is the Deer Dance. The story tells that a young man goes into the forest and shoots a deer, having already gathered sufficient food for his family. The deer transforms himself into a god who teaches the hunter that he should not take more than he needs from nature. In this way, the morality play underscores responsible wildlife ecology. A variety of masks can be associated with these colourful dramas, and are often used interchangeably as their characters appear in more than one drama. The distinctions made by previous authors between Monpa and Sherdukpen masks were based on the mid-century observations of Verrier Elwin. However, recent investigations into this restricted area by Thomas J. Pritzker could not support this distinction, hence the use in this article of both names when referring to masks that were formerly attributed to one or other of these ethnic groups. This is not to say that one cannot recognise stylistic differences, but that they may be attributed to regional as opposed to ethnic variations. The extraordinary similarity between Monpa-Sherdukpen (28, 29) and Japanese masks is no accident. It is clearly a reflection of a shared experience of Buddhist culture. The subject of Himalayan masks is difficult to narrow. In considering the masking phenomenon of the region, we are drawn into a discussion of an ever-widening geographic and historic scale. Through the microcosm of this topic, we may access a macrocosm as broad-ranging as Eurasia and the Americas, and a time-span stretching from upper Paleolithic to the present. The intention here has been to place the discussion in the wider context, for it is in understanding the depth of their contacts that we recognise the great integrity of Himalayan masks. We perceive objects of relevance and become aware of a new art form. Himalayan masks represent a truly international style, with stylistic affinities as far flung as Japan (36), Alaska (35), and Khotan. Underlying this international style is a cultural arrow through time, beginning with the shamanism of the steppes, and moving through subsequent Hindu and Buddhist masquerade traditions. In addition, a continuous dynamic of cross-pollination occurred between tribal and monastery masking traditions, reinvigorating both. Ultimately, following the insights of C.J. Jung - it can be argued that the psychic 'deep structure' motivations for masking did not change and the old gods were reincarnated with new names. 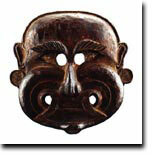 A comparative analysis of large groups of tribal Asian masks reveals, I believe, a general unity of style and meaning. This unity constitutes strong evidence that the masking phenomenon had a common origin. Thus, in cases where the original meaning of masks and their accompanying rituals is lost, we may attempt to infer insights by using data surviving in other, better preserved, masking cultures. Thus, although the Scythian 'animal style' may be site and period specific, the idea that animals have power, both awe-inspiring and worthy of harnessing, is something also recognised by the Nepalese shaman, the monk in a Tibetan monastery and the American Indian totem carvers of the Pacific Northwest. So too, the human yearning for wisdom and compassion, embodied by the bodhisattvas, affects us all. 1. See bibliography for further references to masking traditions in the Himalayas. 2. As noted in Alsop 1993, and Chazot 1988. 4. See Golub 1992, p.70. 5. Sometimes such individuals are recognised early as candidates for shamanism, and are made apprentices to established shamans. Whether they serve this period of apprenticeship or not, they still undergo this testing period of separateness. 6. Chazot, op.cit., and Bradley and Chazot 1990. 7. Chazot (1988, 1990) suggests that masks of the Middle Hills may have served this function. 8. Snellgrove and Richardson 1968, p.21. 10. E.R. Elles 1883 (repr. 1965). 11. For a comparison of the Cham and Lhamo dance forms, see Dorje 1984. 12. Chazot and Hultberg 1989 (unpublished). Alsop, Ian, 'Masks of the Newars', Orientations, no.9, September 1993. Aris, Michael, 'Sacred Dances of Bhutan', National History Magazine, March 1980, pp.38?48. Aryan, K.C., Rural Art of the Western Himalaya, New Delhi 1985. Basilov, Vladimir, Nomads of Eurasia, Seattle and London 1989. Bihalji?Merin, Oto, Great Masks, New York 1970. Bradley, Lisa and Eric Chazot, Masks of the Himalayas, New York 1990. Chazot, Eric and Lawrence Hultberg, Facing the Gods, Smithsonian catalogue (unpublished), 1989. Chazot, Eric, 'Tribal Masks of the Himalayas', Orientations, no.10, October 1988. Dorje, L., 'Llamo: The Folk Opera of Tibet', The Tibet Journal, Summer 1984, vol.IX, no.2, pp.13-22. Elles E.R., Nepal and the Gurkhas, London 1883 and reprint 1965. Elwin, Verrier, The Tribal Art of Middle India, Oxford 1951. Estournal, Jean?Luc, Les Masques Himalayens, Paris 1989. Fitzhugh, William and Aron Crowell, Crossroads of Continents, Smithsonian 1988. Fuchang, Yanm, The Art of the Mask in Sichuan, China 1992. Golub, Mort, 'A Himalayan Mask', HALI 63, June 1992, pp.70?71. Govinda, Gojami, Tibet in Pictures, Volume I, Emeryville, California 1979. Ivanov, S., Ancient Masks of Siberian Peoples, Leningrad 1975. Jettmar, Karl, Art of the Steppes, New York 1967. Koppar, D.H., Forgotten Art of India, Baroda 1989; Tribal Art of Dangs, Baroda 1989. Legg, Stuart, The Barbarians of Asia, New York 1990. Lhalungpa, Lobsang, Tibet, the Sacred Realm, Massachusetts 1983. Lommel, Andreas, Masks: Their Meaning and Function, New York 1970. Lommel, Andreas, Shamanism, the Beginning of Art, New York 1967. Loviconi, Alain, Masks and Exorcism of Sri Lanka, Paris 1981. Martynov, Anatoly, Ancient Art of North Asia, Illinois 1991. Mookerjee, Ajit, Indian Primitive Art, Calcutta 1959. Nishikawa, Kyotaro, Bugaku Masks, Tokyo, New York, San Francisco 1978. Norboo, Samten, 'Migration of the Tamang Tribe from India', The Tibet Journal, Spring 1981, vol.VI, no.l, pp.39?42. Pal, Pratapaditya, Art of Nepal, Berkeley 1985; Art of Tibet, Berkeley 1983. Pannier, F. and Mangin, S., 'Masques de L'Himalaya du Primitif au Classique', Arts Primitifs Paris n.d.
Riley, Olive, Masks and Magic, London 1955. Roerich, George N., Trails To Inmost Asia, Yale 1931. Rudenko, S.I., Frozen Tombs of Siberia, Berkeley 1970. Sharma, R.R.P., The Sherdukpens, Shillong 1961. Singh, Manjaneet, Himalayan Art New York 1968. Sioris, George, 'Buddhism in Asia: Tolerance and Syncretism', The Tibet Journal, Spring 1988, vol.XIII, no.l, p.20?29. Slattum, Judy, Masks of Bali, San Francisco 1992. Snellgrove, David and Hugh Richardson, A Cultural History of Tibet, New York 1968. Stein, R.A., Tibetan Civilization, Stanford 1972. Teten, Timothy, A Collectors Guide to Masks, New Jersey 1990. Tsultem, N., Mongolian Sculpture, Ulan Bator 1989. Tung, Rosemary Jones, A Portrait of Lost Tibet, New York 1980. Weihreter, Hans, Schmuck aus dem Himalaja, Austria 1988. Yeshe De Project, Ancient Tibet, Berkeley 1989. Zwalf, W., Heritage of Tibet, London 1981.